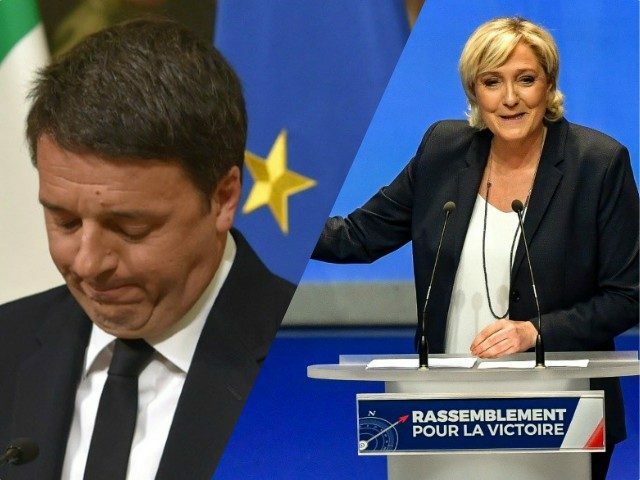 French populist leader Marine Le Pen squared off against former Italian prime minister Matteo Renzi, slamming the him on Brexit and his term as PM. The pair faced each other on the French television programme L’emmision politique earlier this week and the debate between the pair quickly became heated, with left-wing former PM Renzi launching an attack against the Rassemblement National (National Rally, formerly Front National) leader, Il Giornale reports. “Madame Le Pen, it is true, I have lost a few times, but she has always lost, in all the elections in which she participated: the 2012 presidential elections, 2017 presidential elections, the regional presidential elections,” he gloated. “Marine Le Pen and Matteo Salvini said that with the Brexit in London there would have been better hospitals, that the British economy has never been better. But it is not true, it is the exact opposite happening: being in favour of Europe is not naive, it is useful for portfolios, for work,” he claimed. “We hope to see that too. In fact, we French people would like to have 4 percent unemployment as in the UK, and their economic fundamentals,” Le Pen added. Since last year’s election that saw the populist coalition of Salvini’s Lega and the Five Star Movement come to power, Renzi quit as leader of Italy’s Democratic Party and in recent months has been plagued by a scandal involving his parents who were placed under house arrest in February. Le Pen, meanwhile, continues to lead the RN, who look set to make a strong showing in the European Parliament election in May, rivalling President Emmanuel Macron’s Le Republique En Marche! (LREM) in opinion polls.